This month, I’m trying something a little different for our monthly topic for discussion. I recently read an article by Brooks Carder, a longtime member of ASQ who recently worked with our board. Brooks shared the following piece that he’s written for ASQ’s Human Development and Leadership Division newsletter. I think it is well worth our time to read, discuss, and learn from. As Brooks points out, we have all gone through some kind of conversion. We know in our hearts we can help make this world work better. We don’t need to be over-the-top, but we should have the confidence to tell our story, understand our own value, and inspire others. How do we spread the message of quality in a marketplace overflowing with ideas about how to boost profitability and ever-changing management trends? When I read this, it reinforced my belief that quality is critical to the function of the economy that is described here. But many of us do not appear to realize that. Consider ASQ’s mission: To increase the use and impact of quality in response to the diverse needs of the world. In my opinion this is not sufficiently ambitious. After all, quality is responsible for many of the things that make life better. Just the change in automobiles would represent major improvement in the quality of life, an improvement that was enabled by quality. My own version of a mission would be: To improve the function and value of goods and services worldwide, and to facilitate the development of new products and services that improve the quality of life. You may think that this is too ambitious. After all, are we not just a bunch of nerd engineers, sitting at the end of an assembly line, keeping statistics and occasionally convincing someone to change a process for the better? Well, we are what we think we are. But we should not just settle for that. We have undergone a conversion, and it’s a conversion that is very much like a religious conversion. We believe in something that most people don’t believe in. The something we believe in can make life better in the here and now. We need to understand that this religion must be preached. My own conversion was at the feet of the Billy Graham of quality, Dr. W Edwards Deming. I had the great good fortune to attend six of his four-day seminars during the final years of his life, and even had some brief conversations with him. My conversion was literally an epiphany. As a scientist I had difficulty understanding why business was conducted in the way that it typically was. Deming explained that my instincts were right and showed me the path to apply scientific knowledge and common sense to business. Each of us has undergone a conversion. Probably many of them have been dramatic. Mine certainly was. So small groups of us get together for dinner once a month and engage in our rituals. There is no incense, no chanting, no hymns, and no vestments for the leaders, unless you count our leadership team polo shirts. But our religion is not as healthy as it should be. Our numbers are getting smaller and our members are getting older. Where is our outreach? The Mormons send their best and brightest young people around the world on two-year missions to spread the word. But before we can mount an effective outreach, we need to appreciate the value of our own conversion, and the huge contribution we can make if we can bring our full capacity forward. 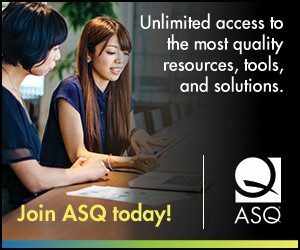 Author Bill Troy ASQ CEOPosted on December 1, 2014 Categories ASQ, case for quality, UncategorizedTags brooks carder, human development and leadership division, mckinsey quarterly8 Comments on Is Quality Ambitious Enough?